Cheap and quiet accommodation is available for visitors to Thailand’s upcoming international horticultural show, but some may find it too quiet, the lodgings are in the funeral hall of a Buddhist temple. Three million visitors are expected at the Royal Flora Ratchaphruek 2006 which opens Wednesday in the northern city of Chiang Mai and lasts until Jan. 31, the Bangkok Post reported Saturday. 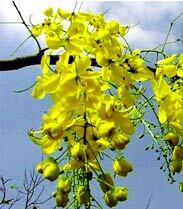 The yellow, five-petaled Ratchaphruek is Thailand’s national flower. The event, being held in honor of the country’s revered King Bhumibol Adulyadej, is expected to strain the capacity of the area’s numerous hotels and guest houses, so local temples are also throwing their gates open to visitors, the newspaper reported. At least one temple, Wat Jet Yod, will allow guests to sleep in its funeral hall, where religious rites for the dead are held before the departed is cremated, also on the temple grounds. The price is a bargain 20 baht ($0.54) per person per night. No alcohol or noise allowed. Surveying the crowded docks of the Las Olas Municipal Marina at today’s opening of the Fort Lauderdale International Boat Show, your eyes wander over a sea of gleaming-white megayachts, each more expensive and tricked out than the one next to it. In the crowded sprawl of Manila, the living must compete for space with the dead. Fortunately for Virginia Bernardino and hundreds of other slum dwellers who have moved into the largest cemetery in the Philippines, the deceased don’t seem to mind. For years, Manila North Cemetery, a public graveyard in the center of the capital of 12 million people, has been a thriving community for those evicted from their homes or flocking from the provinces for better opportunities in the big city. After being forced from their state lot beside the cemetery to make way for a new graveyard, Bernardino and her husband have converted her mother-in-law’s mausoleum into a home for their two sons, their wives and children. Living conditions are basic but the residents manage some creature comforts. Clothes hang from lines strung among the makeshift shacks and television sets flicker in a few homes with electricity stolen from nearby power lines.